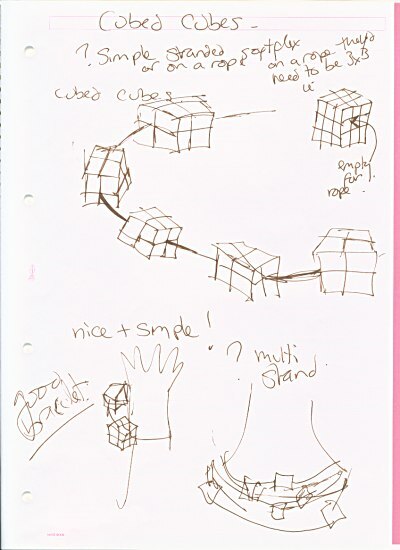 This is the original sketch, drawn at the end of 2001, which kicked off my Cubed Cubes Series. The only problem I had was; I knew exactly what I wanted to make, but had no idea how to make it! So although I had added the comment 'nice and simple!' to the sketch- at first it proved not to be. I tried many variations on stitching one row and then trying to add another row on top- but as anyone who had ever tried this with cube beads can tell you- it's not the easiest thing to do- needles don't always like bending around corners! So apart from this sketch and some samples the idea didn't develop for a few months until I beaded the bracelet that forms the next part of this series.